1. In a bowl, whisk together peanut butter, 1/3 cup water, soy sauce, sugar, lime zest, lime juice, sambal olek and garlic. 2. Trim the ends of the eggplant. If using baby eggplant, peel them. Place in a steamer basket set over a pan of simmering water. Cover and cook until tender, about 10 minutes. (Alternatively, you can wrap the eggplants individually in parchment and microwave until tender, 3 to 4 minutes.) 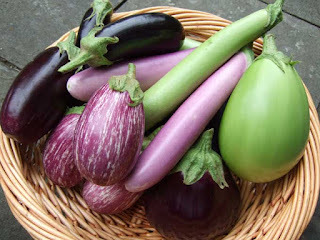 Halve eggplants lengthwise. 3. Transfer eggplants to a platter, cut side up. 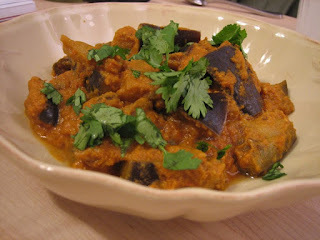 Spoon peanut sauce over eggplant. Garnish with peanuts and scallions. This got me so excited!!! If I start feeling better today - I'm going to make it tonight! I've got most of the things on hand too! :) sounds delish.